Deadman wanders the streets during the chaos of Crisis on Infinite Earths, doing his part to save lives wherever he can. He is summoned by Rama Kushna and told he is needed for a mission in the antimatter universe. 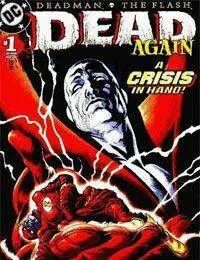 Deadman is then returned to where he was before. The Flash appears and as he disappears, Deadman dives after him, finding himself appearing in the antimatter universe. Deadman watches as the Flash sacrifices himself, destroying the Anti-Monitors machine. Deadman escorts the Flashs soul toward a bright light, which is being guarded by Darius Caldera, who captures the Flashs spirit in a bid for power.